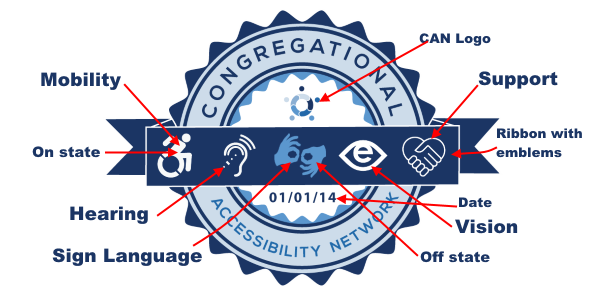 The CAN Seal is awarded to any congregation who completes and submits the online Congregational Assessment Survey. There are two ways this seal is generated at the end of the survey. CAN Online Seal. Code is generated for insertion into the congregational website. Features of the seal are illustrated below. CAN Certificate. A Personal Document Format (PDF) file is generated. This file can be read using the free Adobe Reader or another PDF reader. The certificate can be printed using any common color printer.